Ahead of his talk at IATEFL 2011 entitled ‘Don’t give up on idioms and phrasal verbs’, Stuart Redman, co-author of Oxford Word Skills, ‘gets to the bottom of‘ idioms in the English language. What’s the first thing that comes into your mind when you see these expressions? Your answer is probably that they are all idioms: groups of words that not only have a meaning that is different from the individual words, but also a meaning that is often difficult or impossible to guess from the individual words. If someone is barking up the wrong tree, they have the wrong idea about how to get or achieve something; it has nothing to do with – or is unlikely to have anything to do with – dogs or trees. If you have egg on your face, you might need a handkerchief, but it’s more likely that you are embarrassed or feel stupid because something you have tried to do has gone wrong. These expressions are also good examples of the commonly-held view that idioms tend to be very vivid and colourful expressions. Now, let’s turn to another list of expressions. What do they have in common with the list above? Less obvious perhaps, but the answer, in fact, is the same: they are all idioms. Is the meaning of these expressions very different from the individual words? Not to any great extent. Is the meaning difficult or impossible to guess? Not particularly. Are they vivid and colourful expressions? Certainly not. So, why are they idioms? Categories: Applied Linguistics, Dictionaries & Reference, Grammar & Vocabulary, IATEFL | Tags: Applied Linguistics, Collocations, Dictionaries, Dictionary, English Language, Grammar, IATEFL, Idioms, OALD, Oxford Advanced Learner's Dictionary, Oxford Word Skills, Phrasal verbs, Stuart Redman, Syntax, Words | Permalink. “It’s fewer!! Fewer voters turned out, not less” (My 3 year old seemed relieved it was the radio getting a ticking off for a change!) It bugs me – I don’t know why. Is it the result of being in TEFL for over 20 years and feeling rather superior that [some] broadcasters should have a better grasp of grammar? Possibly. But there are words that irritate me too. ‘Lush’, for example. The only thing I feel should be described as ‘lush’ is grass or some kind of vegetation and I object to it being used as a generic adjective for everything from George Clooney to chocolate cake. Perhaps this is less about the word itself and more to do with its use (or misuse), but it did start me thinking about personal bug-bears and annoyances when it comes to language and words. In the nature of controlled scientific research, I Googled ‘most hated words’ and was surprised at the number of polls that have been taken on this and the range of people who have responded. ‘Literally’ was deemed to be the most irritating word by Daily Telegraph readers and this was in response to a poll run by researchers at Oxford University where ‘At the end of the day’ came in as hot favourite, closely followed by ‘fairly unique’. YouGov ran a poll among the internet community and surprisingly ‘blog’ came in third? Perhaps that was before we all started doing it. Babycenter.com contributors objected to ‘preggers‘. Even ‘bun in the oven’ was preferable to this. Categories: Dictionaries & Reference, Grammar & Vocabulary | Tags: American English, Annoying words, Applied Linguistics, British English, Dictionaries, Dictionary, Emma Belcher, English Language, OALD, Oxford Advanced Learner's Dictionary, Reference, Vocabulary, Word bugs, Words | Permalink. 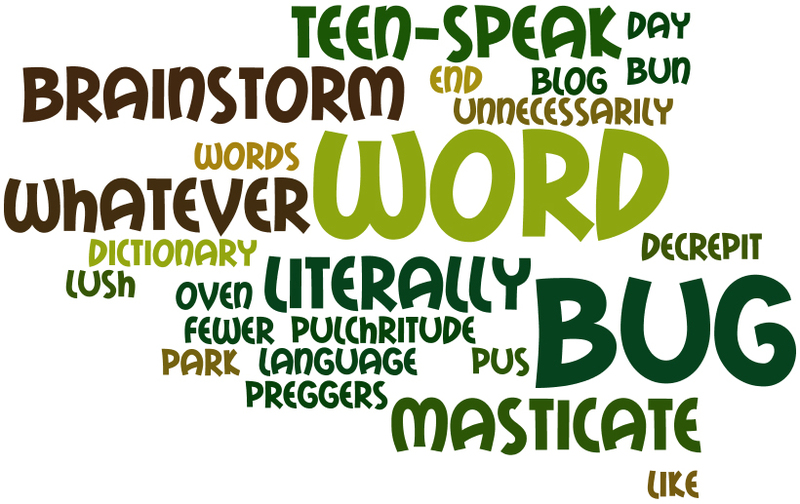 Kieran McGovern strikes out against youth culture and the decline of the English language with his Top 10 most annoying words in common use amongst today’s youths – with a word of warning to those… not-so-young. Here’s my top ten verbal equivalents of short skirts, low cut trousers and hoodies. These should be avoided by anyone over the age of… well, you decide. Dude – meaning: male person. Has become pretty universal amongst young Americans and increasingly in the UK, too. A great word with a long pedigree, like a baseball cap it does not suit greying hair. Awesome! – should only be used for that which truly inspires awe. This does not include the a new cover for your mobile phone. Banging (great) safe (excellent) ‘hood (neighbourhood) homie (friend) – this job lot of street slang is the private property of teenagers. Sounding like a wannabe gangster is inexcusable if you have a mortgage. Cool! – the exclamation mark is the line in the sand here. Describing something as ‘pretty cool’ is acceptable but not squealing c-o-ol! Wicked – (meaning great) Life is complex enough without calling bad things good and vice versa. Chillin’ – perhaps a controversial one but I think the world would be a better place without the phrase ‘chill out’. Skank – horrible word meaning someone of low class, sometimes also used to suggest sexual promiscuousness. Don’t use, ever! Gay – meaning rubbish, as in ‘that’s so gay!’ As used in the school playground it doesn’t generally have a sexual connotation, but best avoided. OMG, LOL etc – I know they’ve just entered the OED but there is something a little embarrassing about ageing fingers typing this kind of text short-hand. Whatever! – this is irritating enough coming from truculent teenagers, unacceptable from anyone old enough to vote. What do you think? Am I being unfair? A language despot? Or are there more words you’d like to add? Kieran McGovern blogs at English Language FAQ. Categories: Applied Linguistics, Grammar & Vocabulary, Teenagers, Young Learners | Tags: American English, Annoying words, Applied Linguistics, British English, Dictionaries, Dictionary, English Language, Kieran McGovern, Vocabulary, Words, Youth culture | Permalink. Kieran McGovern considers why some verbs in English are so difficult for language learners to grasp and how they have changed (and continue to change) over time. Here are the ten most heavily used verbs in the English language: be, have, do, say, make, go, take, come, see, get. Do you notice what they have in common? They are all irregular. There are around 180 irregular verbs in English – a small fraction of the many thousands of regular ones. They punch above their weight*, however, making up 70% of the verbs in everyday use. So how have these tricky customers evolved? And why are they so central to English? The psychologist, Steven Pinker, has an interesting theory. He says that irregular verbs are “fossils of an Indo-European pre-historic language.” This had a regular rule in which one vowel replaced another. Irregular verbs are notoriously difficult for language learners – native speakers struggle with them, too. It takes children years to learn to use ‘spoke’ and not ‘speaked’. Some never learn that nobody ever ‘writ’ anything (as opposed to ‘wrote’). In fact many of the grammatical mistakes commonly made by native speakers – ‘we was’, ‘they done’ etc. – involve irregular verbs. Categories: Applied Linguistics, Grammar & Vocabulary | Tags: American English, Applied Linguistics, British English, English Language, Grammar, Grammatical mistakes, International English, Irregular verbs, Kieran McGovern, Regular verbs, Words | Permalink.